I've talked about the PreCure franchise quite a bit. Including Futari wa, Max Heart, & the first Max Heart film. Thus far, the weakest thing I've seen for the franchise was the mediocre Max Heart. The first film based off of that series managed to avoid a lot of its problems and turned out pretty well. Hopefully, the same will hold true for this week's fare. 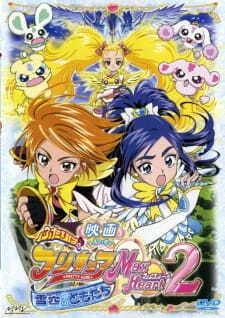 Futari wa PreCure: Max Heart Movie 2- Yukizora no Tomodachi. We open with an old man carrying an egg and flying across the sky on the back of a flying squirrel, Muta. Muta warns the old man, Roshi, not to drop the egg. Roshi says he won't but does and that's why his grand kids never call or visit. Two ice looking guys sense the situation and move to get to the egg. We cut to the one girl... You know, the boring one who was introduced in Max Heart that I can never remember the name of... I want to say Kanade. She's working with Akane when she finds the fluffy little bird that hatched from the egg. From there we get to see our heroines, Honoka & Nagisa, as they're enjoying a ski trip. But what is this mysterious creature and why are Freezen & Frozen after it? Let's start with the issues with the film. The biggest one is just that it drags quite a bit. Take the ending. We get our climactic fight and then a good ten minutes of an attempted, but not well executed, secondary climax. We also have some completely pointless scenes of Honoka's grandmother. I liked her grandmother in the series but there's no reason for her to be in this film beyond an early phone call where she gives Honoka some advice. Nothing else she does has any impact on anything. The scenes that surround Ellen in general are just a drag. They revolve around her “bonding” with our mysterious friend but its very clumsily done since most of it is her holding the thing while looking dull or watching it also while looking dull. There's also a part of the film that revolves around Nagisa & Honoka having a fight but the impetus behind it is really weak. Basically, Nagisa overhears some random people who have mistaken Honoka & Fujipi for a couple and she gets upset because that's her Honoka, dammit. Here's the thing, though, Nagisa has known since before Max Heart even started that Honoka & Fujipi are old friends and she also knows that there's nothing more to their relationship than that. There's absolutely no reason for her to be upset here. There are also parts to the film I like. In concept, I like the idea of contrasting a pair of true friends who will overcome their difficulties with a pair who will only stay close when things are going their way and I do like a lot of the scenes surrounding that, even if the event that kicks off that plot point is weak. A lot of the Honoka and Nagisa scenes in general are just good. I particularly like the moment where they talk about their hearts burning for one another. The characters are much the same as they are in the series proper. Nagisa and Honoka are still great characters. Ako is still entirely bland. It's nice to see Shiho and Rina get some nice support scenes. The villains are nothing ground breaking but they're fine. The same can be said for Muta, Roshi & our little bird. They're not interesting characters but they work for what the film needs them to do. Pollun is, unfortunately, back to being a major annoyance. He does throw a loud, obnoxious tantrum in this one. Honoka and Nagisa need to start packing heavy duty duct tape. The artwork is nicely done. The action sequences flow well and the backgrounds are well detailed. I particularly like the way the film captures both a very picturesque winter wonderland aesthetic and a very oppressive frozen wasteland at different parts. The magical kingdom isn't nearly as pretty as the Garden of Hope was in the first Max Heart film but it's decent enough. I'll quickly go through the major characters, since I've talked about their performances at least twice previously. Honna Youko & Yukana are great. Tanaka Rie is a great actress but her performance in this is flat because Miyuki is a bore. Ikezawa Haruna's performance is annoying because that's the aesthetic they decided to go with for her character. Moving on to the film exclusive characters, Nozawa Masako returns. In the last film she was Round & Honoka's grandmother. In this one she's Muta & Honoka's grandmother. Her performance is good. You can't even tell by ear that Muta and the grandmother have the same voice. Aono Takeshi voices Roshi and he does a fine job. Our villains are voiced by Kusao Takeshi & Hiyama Nobuyuki. Both of whom deliver nice performances. Hinata is voiced by Chijimatsu Sachiko and she's decent enough. Like with the last film, Futari wa and the main series, we have a Sato Naoki soundtrack which includes Max Heart's theme tune. Which is basically Futari Wa's theme tune with minor changes. Still, he is a good composer and it shows here. Honoka and Nagisa definitely have some. And it culminates in the “burning hearts” scene. Because this is PreCure and shoujo ai subtext is what they do. Actually, is it even subtext at this point? They've held hands while cuddling up in bed and talking about how close they are and now we get the hearts burning for each other. It might qualify as just text at this point. This is actually what I expected from a Max Heart film when I reviewed the first one. It has some strong moments, some weak ones and just averages out to be kind of mediocre. If you enjoyed Max Heart or if you were a fan of Futari wa who doesn't mind putting up with Yayoi and Pollun for some cute Nagisa & Honoka moments you might enjoy watching it. For myself, I give it a 5/10. Next week I'll look at Chocolate Underground. I can't say I'm too big on Max Heart when compared to all the other Precure I have watched so far, but I'm glad to see that I will end this entry in a good note thanks to this good movie that used nicely the element that in my opinion is the strongest part of Futari wa: the friendship between Nagisa and Honoka. A new mascot character appeared for this movie in the form of Houou, who is in danger due to the attack of a duo of enemies wanting to get rid of her to bring an end to the world, this together with the previously mentioned part are what this movie focuses on and I think that it did a nice job doing so, delivering good emotional moments and showing more than ever that the bonds between Nagisa and Honoka are strong despite the problems that they might sometimes have. The artistic quality was more or less on the same level of the TV series, which is perfectly fine because it's nice, and the action scenes were well animated through the movie. This movie has some characters introduced in Max Heart with big presence so it's hard to recommend it if you haven't watched it yet, which is a bit of a shame in case you aren't too big on this entry but liked Futari wa, with that said, I would definitely recommend this movie to anyone who likes the main duo of Futari wa and wants to see more of their frienship being a big focus.